How’s everyone doing on those 2016 running goals? In case you’ve hit a plateau or are looking for a little extra motivation to stick with your plan, we have Coach Matt Thull with ThunderDome Running with us today to provide a few tips on setting appropriate goals and then laying out a plan to achieve them. Whether you hope to PR, tackle a new distance or just make it through the year without getting sidelined with an injury, Coach Thull has tips to make this year your most successful yet! How do you recommend runners go about setting goals for the upcoming year? The nice part about goals are that they are INDIVIDUAL. That individuality is awesome because of the flexibility of setting several different kinds of challenging goals for a training/racing year. The goal can be completing your first race of a certain distance or simply running a new PR at a different race distance. All lead to having more fun, running faster and moving toward your BIG down the road running goals. The right mix of attainable short-term goals versus time goals is way more fun than saying running a certain time or bust is the entire goal of a full year of training. Why is it important for runners to set goals? The short- and long-term goals get you out of bed and out the door each day. The progress you see on a daily, weekly and monthly basis is hopefully the motivation and positive momentum that keeps fueling the ambition to put in the work. In my training, I have daily goals and keep track of them in a running log, and when my ambition or confidence are low, I look back at the SMALL goals I have knocked out and know all of the small daily goals are contributing to the big goal months down the road. If all you look at is the big goal way in the future, there are too many opportunities for excuses and missed training. If a goal is 8 months down the road, you feel like you might be “allowed” to take more days off. With the small/short-term goals you have direction and motivation every single day to not be complacent. Let’s address some of the most common goals. What steps do you recommend runners take if they want to set a new PR in 2016? Having a plan is huge because a carefully laid out plan/schedule leads to consistency/injury-free training and stacking weeks of training, whether it is training for a 5k or a marathon, is the key to success. That positive training progression leads to more motivation and fun and that all leads to faster training and racing. In 2016, runners might have an overall mileage goal, to run their first 5k or marathon or to run PR’s … but all of those goals have pockets of important planning leading up to them, and when you have those short- and long-term goals on paper and planned out, the goal has a better chance of happening. Plan out the number of days you can dedicate to your goal based on your life schedule. Training should not be stressful so put in the work but do all you can to balance everything you do each day. I like to look at things in my running planning as I “NEED” 1 day per week that I can set aside that all important time, focus, and energy to do a hard workout or long run, no matter what, and from there I work things around that key training day. What about successfully racing a new distance – how can runners achieve this goal? Tier your goals into categories of feeling good, finishing and finally a good, better and best case scenario time goal. It is more fulfilling and less pressure packed if you can have 2-3 race goals and those goals are NOT 100% finish time based. So many times runners racing a new distance (many times the half marathon or marathon) base the sole measure of success on the finish time. There are so many weekly goals to accomplish and just getting to the race starting line is a victory and pretty cool. The list of progressing goals is way more fun than having everything hinge on a finish time. Part of goal setting is being realistic but still pushing yourself. It’s a tricky balance and may include having fun training, running a certain amount of miles/weeks leading up to a race, getting to the start line healthy, and finally the BONUS goal is running a solid time in the race. Some runners plan on increasing their mileage this year. What’s the best way to do this without risking injury? What works really well before increasing running DISTANCE or adding an extra day of running per week is to use that extra day/time you will eventually run by adding in a cross training activity/day. Swim, bike, elliptical, yoga … something that is low impact to get your body/legs used to that extra day of activity/volume. 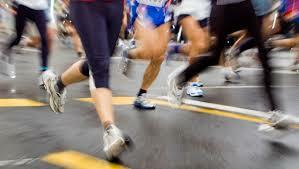 After a month of that extra day and extra time cross training, add in an extra day of running. On the extra day of running measure things by completed minutes at first instead of MILES so you don’t have to worry about running a certain pace or become tempted to run too fast. Runners that spent 2015 on the injured list may want to just focus on running healthy. What tips do you have for staying healthy and injury free? Running is way more than just putting on your shoes and going for a run. Nutrition, sleep, stress management, taking days off, cross training and yoga are sometimes forgotten pieces of training. What leads to success earlier in running does not guarantee injury-free running in the future. Every single training block is different from the previous one so runners should constantly be looking to add or remove pieces of their training – this leads to continued fast running and preventing injuries. In my training, I never ever had the SAME training block leading up to a peak race – even if that peak race was a PR. The next training block had a different bit of strength/cross training work or different focus on recovery in it. Are there any basics that all runners should do to help them run their best this year? As everyone gets a bit more seasoned each year, it is that much more important to include cross training and weights/core to your routine, even if that means “giving away” some running miles or time dedicated to running. Consistent, injury-free running leads to more fun and faster times compared to having all the visits to the doc or PT to fix nagging pains. Gain your confidence and momentum from the things you do well in training and racing, but it is also OK to focus on things you need to shore up. Workouts and races are meant at times to be learning tools and more beneficial to overall training than the finish time you run. If you are lining up at every single race to “race it” for a time and that is all, then you are missing out on valuable learning opportunities to give you the best chance to run your best time down the road. How can working with a running coach help runners have a better chance at achieving their goals? When you are training hard, you are so emotionally involved and driven that you might not be doing the right things at the proper times of training. I can look back at some of my running logs when I coached myself, when I was in really good shape, and wonder why I did some wild workouts. What makes runners great is their drive and ambition along with stubbornness – but so many times those qualities are what lead to overtraining or injury. If you have a running schedule with guidelines, short-term goals or themes for a training week, there is no question what you “should” be doing. Every single day has a purpose, and runners can see that down on paper and know what to do and why. Coaches typically run themselves, have coached a wide range of runners and have studied the sport/training – that’s a pretty awesome array of experience. Good luck to everyone in 2016. Get those goals written down on paper and keep a running log/journal. That journal is one of the biggest motivators out there. If you do something great in your training/racing it is right there on paper to see, but if you are skipping runs or workouts that is down on paper, too. The accountability factor of a running log or having a coach are huge. Thanks for chatting with us, Coach Thull! 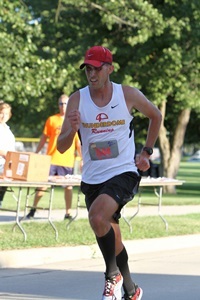 To learn more about ThunderDome Running, or to inquire about coaching services, visit ThunderDomeRunning.com. Let’s Get to Know … Aaron Pierce! With a love of running that spans nearly 30 years, MKE runner Aaron Pierce got his first taste of racing when he was only 4 years old. Today, he still trains and races competitively and also shares his knowledge with the cross country team he helps coach. Read on to learn more about his training, a killer key workout and what he’s learned by taking on the role of coach. Years running: My first race was as a 4 year old, a lap around the warning track at County Stadium (part of the old Police and Fire Run). You could say I have been running ever since! Favorite workout: My long hill loop at Kletzsch Park. Racing the trains that go next to the Interurban Trail and Oak Leaf Trail can be an interesting motivator. Favorite gear: Knucklelights for dark running, and my homemade ‘screwshoes’ that allow for the best traction in wintertime (slotted hex head sheet metal screws work very well). 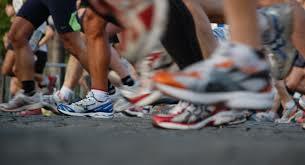 Pre-race routine: Get to the race (without being in a hurry to get there), warm up (usually I like to get in a 2-mile jog before a race that is 10k or less), change shoes, drills, striders and go! I can’t say I have any things that are good luck charms that make me ‘ready to race’. You are either ready or you are not! Favorite post-race treat: Eating everything in sight. This year during a longer cooldown after the Firecracker 4, I ate 6 massive cookies from the refreshment area; it was an amazing experience. Sometimes I will enjoy an ice cream sandwich as well. 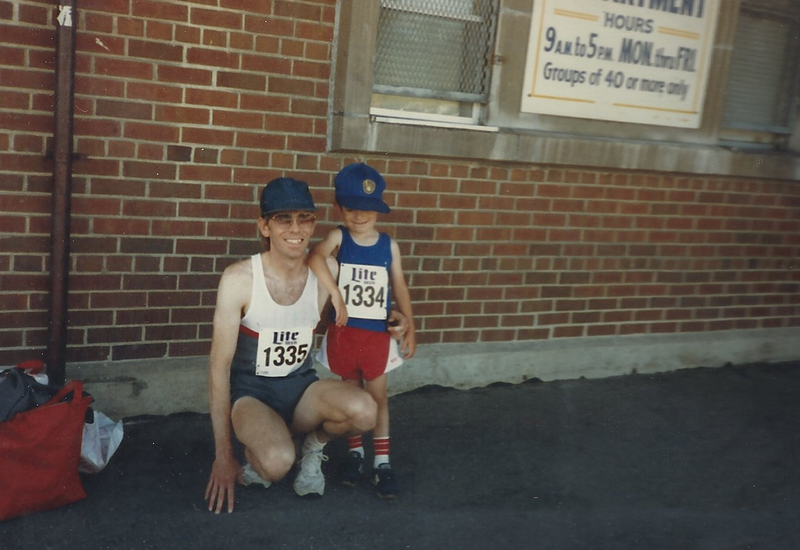 As I mentioned earlier, my first race and probably longer running experience was at age 4. I started running because my dad told me to. I didn’t run a ton when I was a little kid, but I was active and I think I did enough to balance out my Nintendo habit. Steady improvement has kept me running. When I was in high school, I was lucky to finish in the top half of a varsity race. I attended a small college and had an opportunity to run on the team so I did. I finished 3rd from last during the first meet of my freshman year. But I kept working at it, and in my junior season, I received the team’s Most Improved Runner award. In my senior season, I finished 19th in the Chicagoland Collegiate Athletic Conference and was the team’s Most Valuable Runner. Interestingly enough, I had more improvement after college, setting 5k and 10k PR’s as late as 2012, nearly 9 years after my last collegiate race! Being involved in coaching now, I consider all my runs/workouts/races to be continuing research for my coaching knowledge. Usually in the ‘off season’ I am around 45-55 fitness miles per week. At these points I try to fit in one ‘faster day’ and one ‘long day.’ When I am training for something, the mileage goes higher with every 4th week a little less intensity and miles. After a bit of base building, I will mix in some hills and track work and occasional two-a-days. I also like to mix in half mile “pickups” in my runs as a way to transition from base building to when I want to start to focus on faster workouts. My 5k and 10k PRs all came after training 70 mile weeks. In the past few years, I rarely go more than 7 days without an ‘off day.’ I have found that as the miles pile up, off days are pretty awesome. I think it is good to vary the key workouts sometimes so you are not used to a same old routine. With that said, a fun workout is 6-8 x “Kletzsch Park Horseshoes” (about ½ mile). From the light pole that is just about across the street from the north driveway/parking area by the Pavilion and Little Free Library, run north on the grass along the Parkway, and then follow the trail that eventually goes up the long side of the hill. And then you walk easy down the front of the hill, jog back to the starting location and then do it again! If I can knock these out, while keeping the times steadily going faster, I know I am doing something right. Along with your own training and racing, you also coach cross country. Why did you decide to start coaching? Can you tell us how your own experience helps you help your teams? My coaching experience began while I was finishing my last semester in college (2004). I figured since I was still around the school, I might as well help the team out, and the head coach was welcoming in having me around. A lot of the knowledge that I shared with the runners was similar stuff that I learned the previous season (2003) when Matt Thull was an assistant with the team. Then I stuck around the next year, and the next year. . . and so on. I was an assistant with my college team for nine seasons. There were three different head coaches during my time there and they all asked me to return, which spoke of my positive impact with the team. We weren’t the biggest cross country team, but we had some great runners that I enjoyed working with. It meant a lot when during the off-season the runners would ask me to come by and run with them. Now I am working with Head Coach Nicole Hengels at Dominican High School. It is my first season with the team and we are working on building up the program after Coach Nicole restarted cross country in 2014. We are having a blast so far! Lots of fun enthusiasm and improvement and the parents are involved as well. We are even hosting a Milwaukee Running Festival event on Thursday, September 24th, which will be a lot of fun! The best part of this is that I am a Dominican graduate and (obviously) former cross country team member. I could write a book about what I have learned coaching! I have found that coaching is more than just having a binder filled with workouts plans. A lot of it is the psychology of running and helping a runner focus on long-term goals, rather than (relatively) instant success. Also, as a coach, you need to provide a lot of encouragement, especially to younger runners. 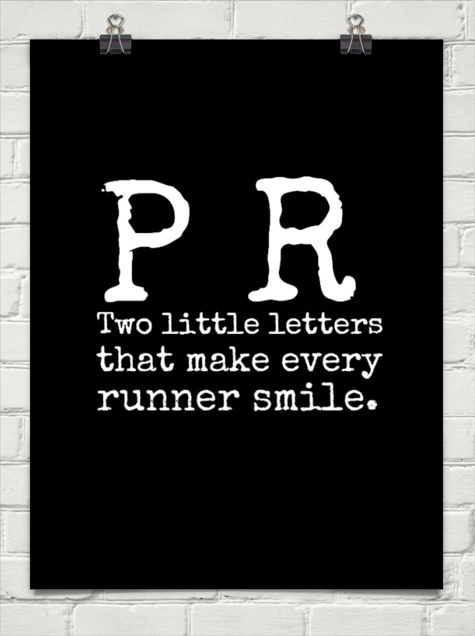 I am determined to knock out an 8k PR at some point! 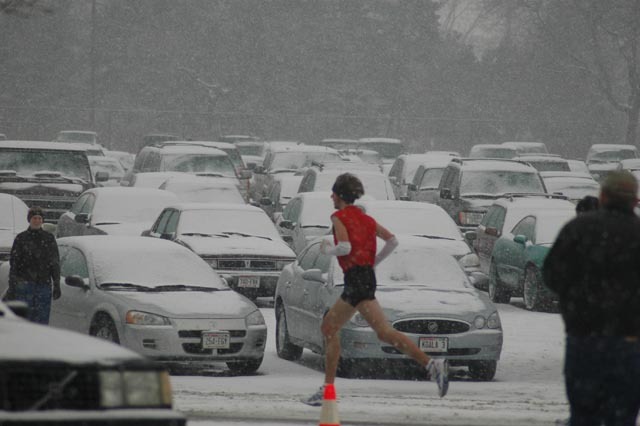 I really need to do Bellin Run one of these years. Guardian Angel Run! 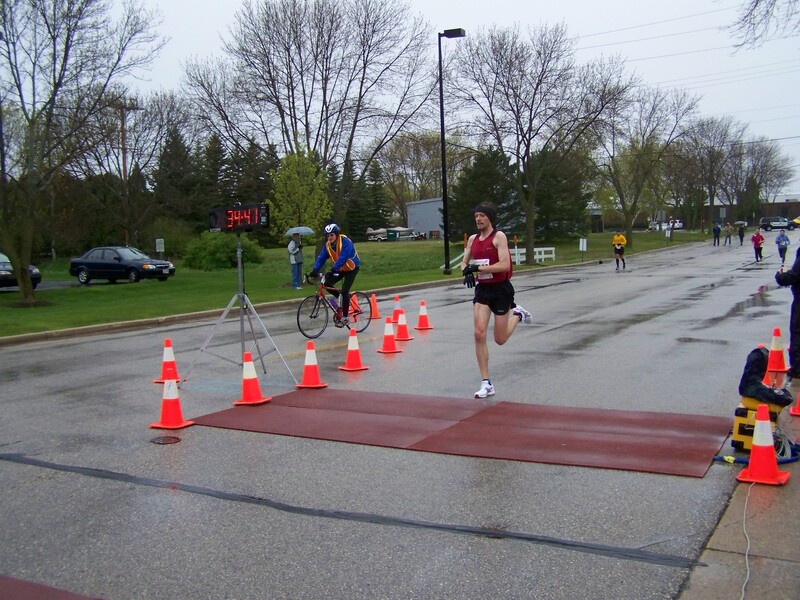 (3 miles) It’s a lot of fun to race around Whitefish Bay on Memorial Day, and the block party after the race has many different ways to refuel after running. Plus, male and female overall winners get their name engraved on a big trophy that stays at the school, so there is some incentive to run fast. There is also a kids race, so you can see the runners of the future scramble around the block. 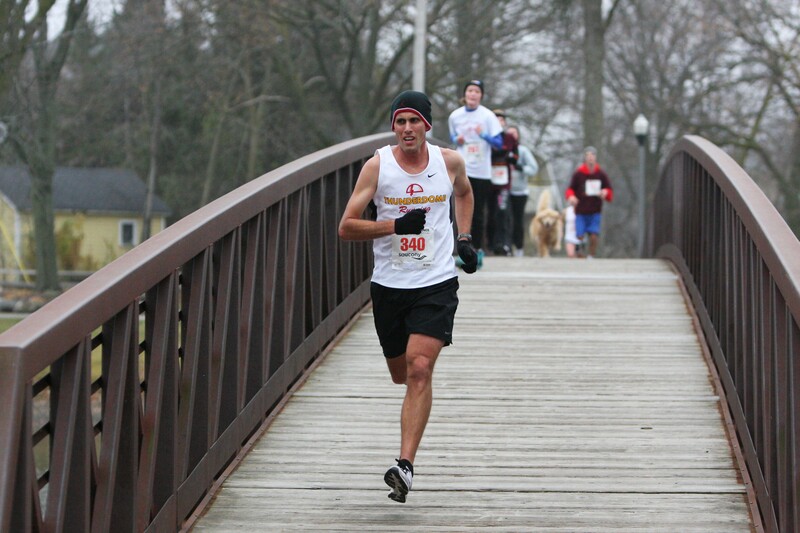 Port Washington Fish Day 8k is a challenging course and can test your fitness. If you go out too fast, you will be pretty wrecked after the 2-mile mark. I enjoy watching the Lakefront Marathon and I try to spectate at a few different points between Grafton and the Lakefront (I am the one that you might see on the course with my green/white ‘GO’ sign). The running community is great; not many cities have so many events, groups, running stores, etc. Plus, we have a lot of trails and neat areas to run. Also, I think winter running is fun. Every day you can run with your footprints in the snow! Thanks for chatting with us, Aaron! 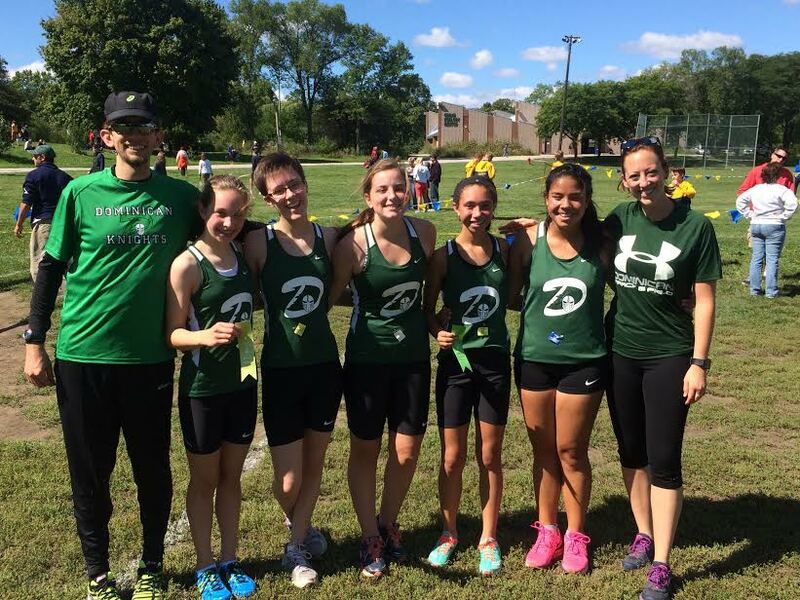 As Aaron mentioned, Dominican High School’s cross country team is hosting a Milwaukee Running Festival event tomorrow, Thursday, September 24th. If you’re free, come check it out – it should be a great time for runners of all abilities!